Today is both World Mental Health and World Homelessness Day, and I think it will be of no surprise to any of you, to hear that mental health issues are common among our service users, especially those who are homeless. So I had been pondering how to address this link with you all for a few days now, however, it was not until this morning that inspiration hit. 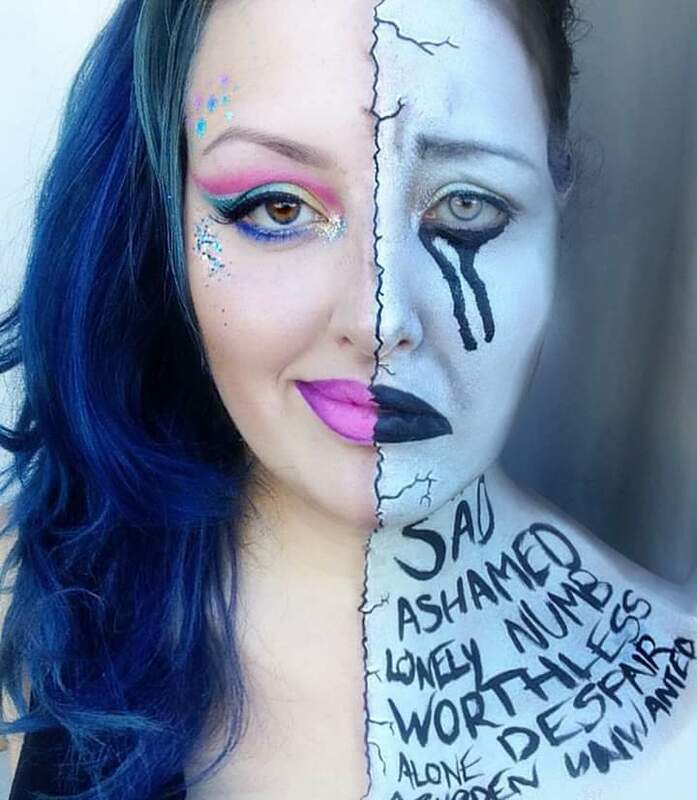 A friend of mine, who I must say is a fantastic make-up artist, posted one of her hard hitting images she does occasionally. 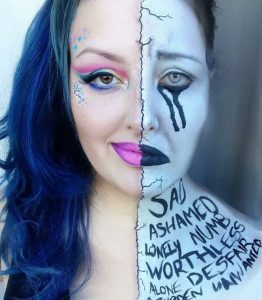 This is a brave post as she suffers from Mental health issues and she explored in this the two faces she has when she is struggling, the bright and cheerful mask she puts on to others and then there is what she is feeling underneath but keeping hidden. So, something in me clicked when I saw this image and it got me to the point where I had something I felt confident enough to say to you all, and that brings me to doors. Whenever I am feeling any of these things I know my tendency is to retreat to my little sanctuary and close the door behind me. Here I can indulge in any of the little self-care tricks I find help, whether that is eating my favourite comfort food, binge watching a new series or simply having a nice long bath. It really doesn’t matter what it is, but we all have our little indulgencies. Now imagine if you have nowhere safe to go, no door to shut and no way to provide your self-care indulgence how do you allow your self the space you need to recover. Truthfully, for many of the individuals who access Maggs there is no way they can provide themselves with healthy self-care. So for many there are three ways these feelings and emotions are released, the first is outwardly. This is the visible aggression and frustration; the shouting, swearing and violence. The second way, is inward, this is self-harm. The final one, which is the main one I want to talk about is escapism, which is the substance use. Whichever way they choose, they enter a vicious cycle in which the feeling just get worse once the initial release is gone. Not only that though, they may have consequences to their actions and as a result housing them gets a little more complicated. Can you see the cycle? So what is the solution? I am not here to offer a quick fix, as for many there will not be one. Instead it got me to thinking about compassion! So often recently we see negative comments on all sorts of news articles targeting the homeless, street fighters and drug users. Whilst this is one side of the debate, we need to remember that these are real people who may see these posts, and maybe instead of re-affirming the words they may be battling internally, they need to hear the positives, for if they hear them enough they may just start to believe them a tiny bit and see within them a hope for recovery! I just need to leave a final note here and that is that I know I am preaching to the converted, Maggs supporters that want to help. However, we can not change the viewpoint of everybody. So challenge negative views, but also when you are talking to a person who is homeless, struggling with addiction, or even just struggling with mental health, remind them in whatever way you can that they are worth something, compliment them on the good things or take time to listen and remind them that Worcester Cares! Exciting News! Maggs is growing!